Planning a weekend in Québec City for the holidays? Here’s your family guide to the best, can’t-miss, kid-friendly sites and restaurants in Québec City. Chris, Trevor, and I have enjoyed a couple of trips to Québec City at Christmas time. We love this city – it’s so stunning during the holiday season – and we’ve seen and done it all! Here’s our ultimate guide to a weekend in Quebec City, with our top 10 best family-friendly sights and attractions you can’t miss (plus all of our favorite kid-friendly restaurants for incredible food)! The following list of incredible Québec City attractions are the ones that we think kids will love most (because Trevor loved them all!). 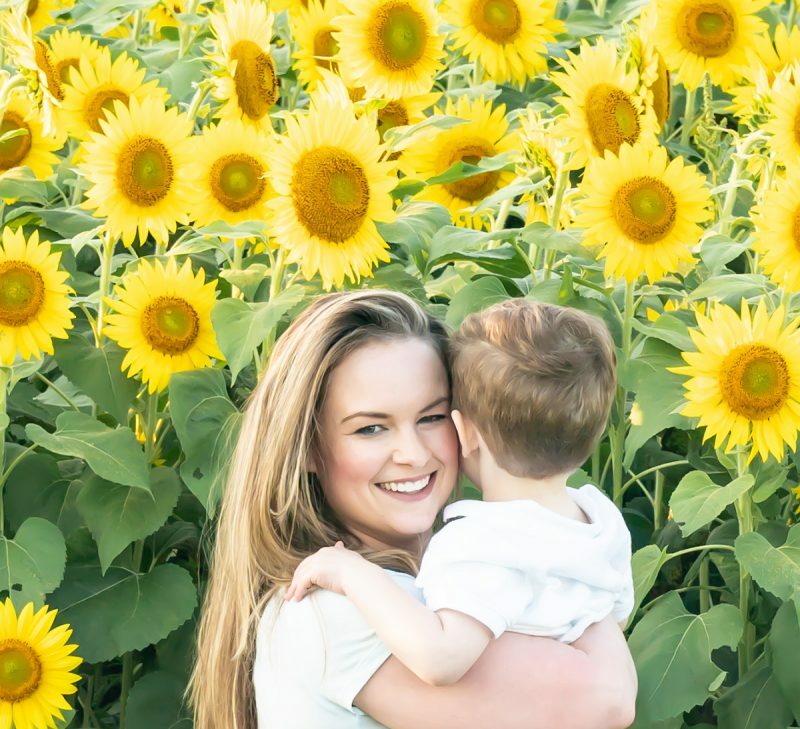 Equally important, these sites are also entertaining, interesting, and fun for parents, too! 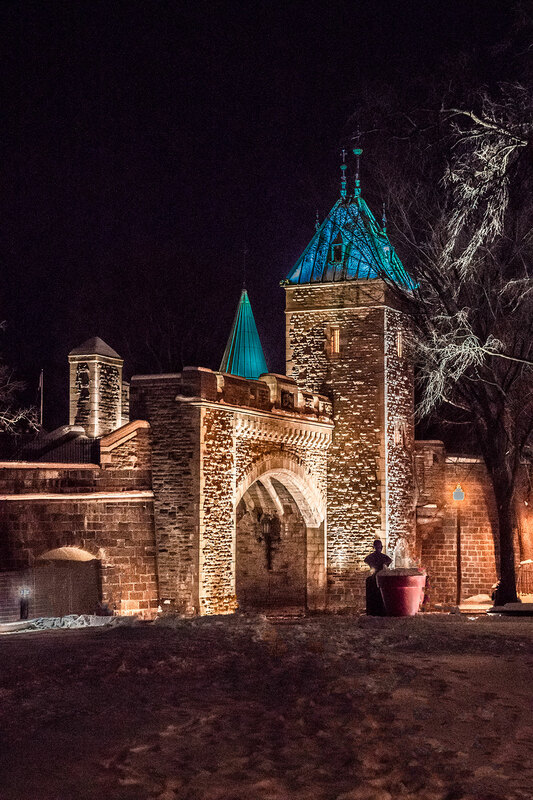 Quartier Petit Champlain is the section of Québec City that families absolutely can’t miss at Christmas. With its 19-century European appearance, Quartier Petit Champlain feels like stepping into an old world, storybook Christmas village. The quaint stone and brick storefronts are all decked out in the most gorgeous garlands and elaborate ornaments, and everything is draped in twinkling white lights. At the end of the street, a snow-capped outdoor Santa’s Village display is, again, like something out of a storybook fantasy. As you wander Quartier Petit Champlain, glance up and you’ll see a literal, dazzling castle on top of the hillside. This is Château Frontenac, and it’s definitely worth a visit. The holiday displays inside and outside this historic building are really stunning. The decor all seems to fit with the grand history of this luxury hotel that was built in the late 1800’s. And the Christmas tree display in the lobby – featuring handfuls of trees decorated by local businesses – is really incredible! 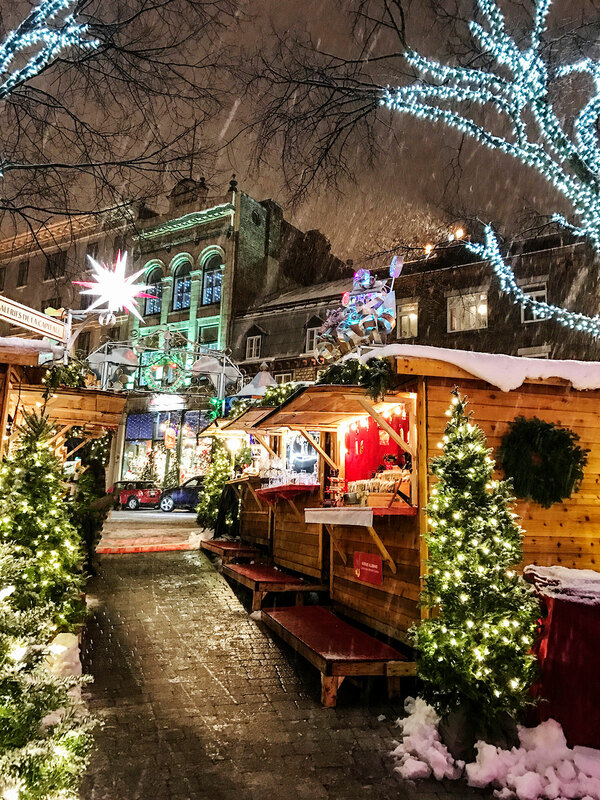 The German Christmas Market seems to be one of the most popular attractions in Québec City at Christmas time. It was always packed with visitors when we passed by. The market is a really festive attraction, with the most charming wooden booths covered in holiday decor and twinkling lights. The aromas of roasted chestnuts and hot chocolate float through the air, and people line up to buy locally made candles, hand-carved toys, pottery, and other holiday gifts. The area surrounding the market is beautifully decorated during the holiday season too. Right across the street from the German Christmas Market is La Boutique de Noël de Québec. This locally based Christmas store is overflowing with holiday decor and Christmas tree ornaments. With all of its twinkling lights and vividly colorful trinkets, Tru was fascinated. And I loved buying a Christmas tree ornament to remind us of our family trip to Québec City! One of Trevor’s favorite spots in Québec City was, of course, the toy store! Benjo is an incredible, locally based toy store with every imaginable toy. Trevor was fascinated with the hands-on toy displays and the giant climb-aboard steam engine. There’s even a café and candy shop within the store. Plus, Santa was there! Tru went right up to him, sat on his lap, and asked for a “yellow dump truck.” And the very friendly and super-authentic-looking “Pere Noël” had a big notepad and quill pen to jot important notes about the whole conversation! Another big favorite of Trevor’s: the Plains of Abraham. This is a beautiful and sprawling park with pathways that wander over rolling hills and overlook the coastline. We saw loads of local families here, sledding down hills, walking their dogs, even cross-country skiing and snow-shoeing. It’s the perfect scenic place to let kids play in the snow and run off some energy! I’ve always loved art museums, and I really want to share this love with Trevor. That’s why I can’t say enough good things about the Musée National des Beaux-Arts du Québec. This large and gorgeous museum has really done so much to create exhibits that appeal to young kids. It’s so rare that I find an art museum so welcoming of families! In addition to the incredible artwork, we found several hands-on, interactive exhibits that Trevor loved. There’s even a special family exhibit that caters specifically to young kids. … and touch tank exhibits where Trevor got to meet gentle stingrays! … and Tru got thisclose to some incredibly giant walruses! He stood at this exhibit for a long time, completely thrilled! The Musée de la Civilisation is a very family-friendly museum that focuses on the rich history of the Québec region. I was afraid Tru might be too young for this museum, but he was fascinated by the towering, colorful, and interactive exhibits. Musée de la Civilisation is huge too. We spent about an hour and a half here, wandering through all of the gorgeous exhibits, until we reached Trevor’s nap time. If it had been just the two of us, Chris and I probably would have spent a couple of hours more. Patinoire de la Place d’Youville is an outdoor public skating rink offering incredible scenic views of the city’s historic stone forts, the Fortifications of Québec. When we visited, holiday lights covered the surrounding buildings, and live music played. The rink was filled with families, and we saw that ice skate rentals were available for a small fee. Café La Maison Smith has a few locations throughout Québec City. Every morning for breakfast, we stopped at the café near our hotel. Maison Smith has a good selection of fresh, artisan, house-made breads, like chocolate croissants and baguettes. Tru loved the blueberry muffins, yogurt parfaits and cinnamon buns. Before visiting this restaurant, Chris and I wondered what Québec City pizza would taste like. The answer: it tastes as wonderful as all of the food in Québec City! The crust at Mille et une Pizzas is super light and crispy and the toppings taste gourmet. We loved this spot for dinner because it checks all the boxes for families: super casual and kid-friendly but also super delicious! Chris called his burger from Le Chic Shack one of the best he’s ever had. Definitely, my house-made fried veggie burger was the best I’ve ever had! It was topped with pickled beets, which sounds unusual but tastes amazing! Le Chic Shack also serves delicious shakes and homemade sodas. Plus the most addictive fries with truffle oil, parmesan and herbs. And the local favorite, poutine (crispy potatoes topped with gravy and cheese curds). This restaurant isn’t so much about the food (although Chris and I did enjoy our meals). CIEL! is all about the view. This restaurant is located on the 28th floor of a hotel, with wall-to-wall, floor-to-ceiling windows offering incredible views of Québec City. The restaurant rotates (very slowly – we could barely feel it moving). So we were able to take in the full 360-degree view by the end of our meal! CIEL! probably would have felt too formal for us at dinner, but we went for brunch and saw tons of families seated throughout the restaurant. It’s a Québec chain restaurant that makes fresh artisan breads and incredible, intricate pastries. To us, it seemed a similar concept to Panera, but far superior. Paillard is a great, casual stop for sandwiches and pizza. Tru was very happy with his broccoli cheddar soup and cupcake. And Chris and I absolutely loved the fresh artisan bread!